The story played out in two different ways. One half took place in the present, on the website itself. 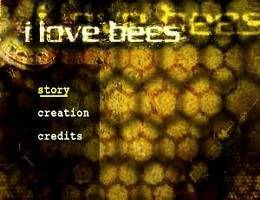 Initially starting out as a pretty basic-looking site about beekeeping and homemade honey production, the site was first mentioned in the theatrical trailer for Halo 2. Within a couple weeks of going up in the summer of 2004, the site went mad. Garbled code, random snippets of story, and corrupted files permeated the page, along with a countdown. Theories abounded as to what the countdown pointed to, with a prevailing idea being that it would be a Halo 2 demo. Once the day had passed however, it became clear that wasn’t the case. What was apparent was that a number of beings now inhabited the website. There was Melissa, also known as “The Op,” a hard-nosed, slightly mad woman seeking out her “crew.” There was the Sleeping Princess (or the Rogue Process, according to Melissa), an ephemeral being who hid out from Melissa in the site’s 404 page and spoke in storybook language. Rounding out the characters were the SPDR and Pious Flea, a repair program and quasi-friend to the Sleeping Princess, respectively. Every Tuesday and Friday the site would see updates. The Sleeping Princess would put up puzzles to be solved on Fridays, but Tuesdays took on a different sort of challenge. Early on, a series of numbers started appearing on the site. Players determined that these were GPS coordinates and times, and that after checking the locations out, there were payphones in these spots. If everything went well, when that time rolled around, the phone would ring, and Melissa, improvised by actress Kristen Rutherford, would answer. She would ask questions of her “crew,” asking them to sing songs, take pictures, and in the case of a few, get their cell phone numbers so she could call them at home. If they succeeded in passing her tests, they would hear a snippet of an audio drama, and if enough people succeeded, the clips would be unlocked on the website. From there the clips were arranged into chronological order, and another story would start to take shape. This audio drama portion is probably the part more people are familiar with, since unlike the rest of the game, a person could simply go back, listen to it, and enjoy a high quality story. The creators of the game, 4orty2wo Entertainment, were able to assemble an excellent and rather well-known cast of voice actors, including the aforementioned Rutherford, Kari Wahlgren, and Yuri Lowenthal. Taking place in 2552, this portion primarily follows five different people—Jersey, Jan, Kamal, Rani, and Col. Herzog—and a former military AI, Durga, as they each deal with the Covenant War and a strange cover-up of a Naval spy ship, the Apocalypso, being blown apart in Earth space. These are essentially ordinary people, though each with specific skillsets and attributes, and they’re just living their lives as best they can as the world falls apart around them. I’ve heard some compare them to the crew of Firefly, and I think it’s a very apt comparison, simply in how they all interact with their peers and, eventually, with each other. Everyone, even Melissa, felt like real people. And the players kept the Puppetmasters on their toes. At one point, Melissa was hunting the Sleeping Princess, and asked her crew about her whereabouts. The PMs didn’t think anyone would turn in such a nice character, and were quite surprised when the player “Weephun” told The Op on the phone that hey, the Princess is hiding out on the 404 page, go get her. One scrambled rewrite later, a story arc where the Princess escaped the Op was put together. Weephun, in the meantime, was ostracized in the game community, because players literally felt like he had betrayed a close friend of theirs. Even after the story ended, the players stayed together. Some ended up buying the Xbox and Halo 2 to play with other Beekeepers, which went on to form two different clans: The Beekeepers and Evade Evade Evade (a common phrase of the Flea). And in May of 2005, players from across the US and Canada came together in Chicago for the Hivemeet, a gathering where everyone could reminisce and hang out. 4orty2wo even put out a DVD of all the audio drama parts, plus photos people had sent the Op, and gave players their blessing to make copies. I, personally, made a number of good friends across the country through this game, and always enjoy getting together with them at conventions or just online. Even the actors, who have gone on to other things, have kept in touch with their Beekeepers to varying extents. When Bungie staffers said that the ILB story was non-canonical, the voracious fanbase complained until finally, in 2006, they did an about face and embraced the story and the mythology. The game even went on to win a GDC award for innovation, as well as a Webby. The new crew made this game more real—and the characters, more alive—than anyone could have expected. I still have my #beekeepers coffee mug on my desk at work. I was sadly too far away from any of the phone locations to get in on that part of the game, but I had a lot of fun working on the puzzles, and was particularly excited to identify one of the coordinates as a particular restaurant I knew in Baltimore—not realizing yet that it was actually the pay phone outside.